I think I’ve been getting too carried away posting all my beauty stuff and as LO haven’t gone out recently that I have forgotten to blog about our special day trip to see the buses! I do apologise… after all, this is supposed to be a mummy-lifestyle blog. 🙂 You can check out the brief overview of our day out to the museum here from an old post or for more photos and a good low-down, read on. I had never realised how many models of buses existed until our trip to the London Transport Musem. It was absolutely fascinating! LO really loves buses and it dawned on me that I hadn’t ever taken him to see the London Transport Museum. I remember I had seen a post via email from Mummy In The City who I’m subscribed to wrote a review on a visit to the museum to see their new family play zone. It sounded fantastic and just the thing for LO and as we had my nephew around for the weekend I thought why not kill two birds with one stone and take them out. I invited a close friend who brought her daughter and we made a proper day out of it which was lovely. When we got our tickets for the London Transport museum which is a one-off charge for adults (£16.00) and is an annual pass (there are no day passes). Children under 10 go free which is an added bonus. The annual pass seemed like a lot of money for a museum visit I thought to myself but I know we’d definitely be back so I was happy to pay for it. Upon entering, I could tell already that it wasn’t money wasted. The children had lots and lots of fun. We went upstairs and saw all the old sleeper trains and played in the pretend-play area which consisted of a red single decker bus, an underground train and a train ticket office. 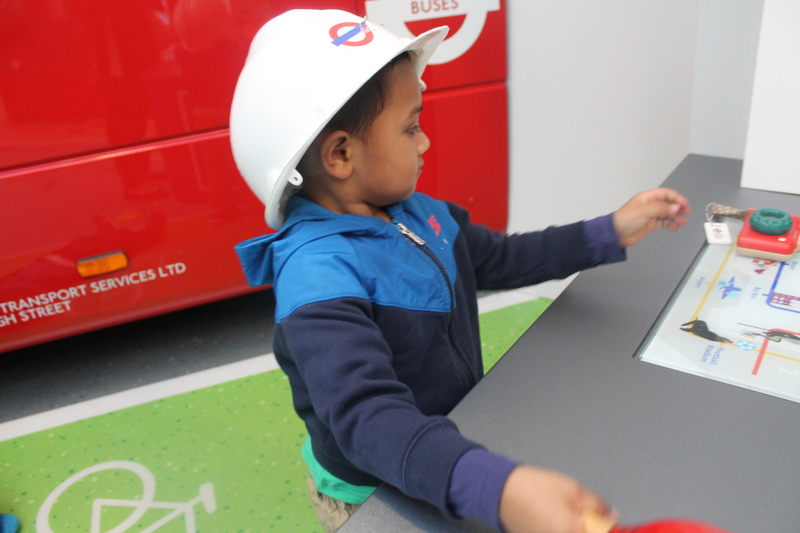 Children could pretend they were the bus driver, train conductor, engineer or TFL staff member. There was hats and uniforms available for the kids to proper take on their new found roles – absolutely amazing! LO loved being the bus driver so much he never really had much interest for the other things available but he was good enough to try it out. We then all went downstairs to the family play zone where there was a double decker bus, river Thames clipper, “lost and found” ball-pit and a staff canteen completely kitted out with all the things you’d find in a kitchen including toy food and a toy microwave. There was also a black taxi cab near the small cafe area downstairs. We all had a fabulous time and when we got home, the kids had so much fun they crashed out for 2 whole hours leaving me and my sister with enough time to put up our feet and rest! It was a tiring day but I definitely recommend it for all mums looking for something to do with the children on a weekend or free day off work. For more info on opening hours and special events they have, check out their website below. Have you been to the London Transport Museum before? Let me know what your views are on it below in the comments box. Have a great weekend! Next Vlogging – What Do You Think?